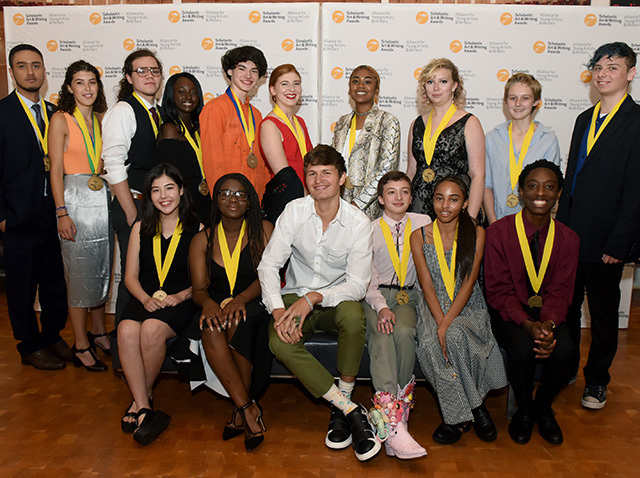 The 2018 Scholastic Art & Writing Awards | Kid Reporters' Notebook | Scholastic Inc.
Actor Ansel Elgort poses with Gold Medal Portfolio recipients before the Scholastic Art & Writing Awards ceremony at Carnegie Hall in New York City. Elgort later addressed the audience. “We believe that artists play a profound role in transforming their time and shaping the future,” says Virginia McEnerney, executive director of the Alliance for Young Artists & Writers. On June 7, the Alliance honored nearly 800 students at the Scholastic Art & Writing Awards National Ceremony at Carnegie Hall in New York City. This year, there were a record 346,000 submissions in 29 categories. After regional competitions, more than 2,800 students received national recognition in such categories as flash fiction, poetry, journalism, photography, and sculpture. Sixteen high school students received the program’s highest honor—a Gold Medal Portfolio award, which comes with a $10,000 scholarship. The Scholastic Art & Writing Awards are the nation’s longest-running awards program for creative students in grades 7 through 12. The program was established in 1923 by Scholastic founder Maurice R. Robinson. Over the years, several prominent artists and writers have been awards recipients, including Andy Warhol, Truman Capote, Sylvia Plath, Cy Twombly, Kay WalkingStick, Ken Burns, Robert Redford, Joyce Carol Oates, Stephen King, Luis Jiménez, and Zac Posen. At this year’s event, Marc Brown, the Emmy Award-winning creator of the children’s book and television series Arthur, received the 2018 Alumni Achievement Award. I love to write about my family and my heritage. My dad is from Seoul, South Korea, and my mom is from the Canadian province of Newfoundland. I love to write about the stories they tell me. My work is about the wage gap between females and males in the workforce. Men—because they’re making more—can be kind of oblivious to the fact that women aren’t making as much as them. In my cartoon, the man is standing on the money and not seeing the issue. My dogs are a big part of my life. I want to display the human connection between dogs and my family. Through this award, I was able to prove myself. It means a lot for my future. Editor’s Note: Two former Scholastic News Kid Reporters and three current Kid Reporters were among those honored in the 2018 Art & Writing Awards competition. They are: Jeremy Hsiao, Bridget Li, Georgia Limcaoco, Sunaya DasGupta Mueller, and the author of this article, Maxwell Surprenant.